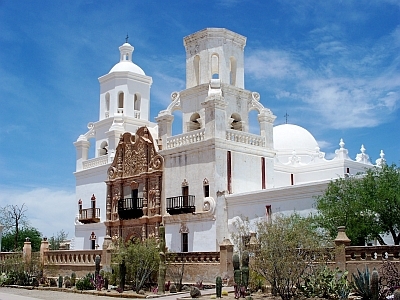 Pueblo Grande Museum Auxiliary is excited to offer you a tour of the missions of Southern Arizona. The tour will be conducted by Across Arizona Tours and will depart from Pueblo Grande Museum in Phoenix. Day One: There will be a guided tour of DeGrazia Gallery in the Sun in Tucson and Mission San Xavier del Bac with an overnight stay in Green Valley. Day Two: A private tour of Tumacacori National Historical Park including a special visit to the ruins of Guevavi and Calabazas mission, weather permitting. 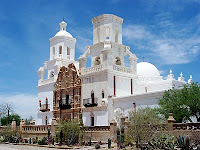 The tour will continue with a visit to the Village of Tubac “Where Art Meets History” and Tubac Presidio State Historic Park, before returning to Pueblo Grande Museum in Phoenix. The tour will depart from Pueblo Grande Museum on Saturday, February 23 at 8:00 am and return to the museum on Sunday, February 24 at appromimately 6:00 - 6:30pm. * The above fee includes a $50.00/person tax-deductible gift to Pueblo Grande Museum Auxiliary, admission to museums and sites described. Day 1 - lunch, lodging in Green Valley, and Day 2 - breakfast. The tour also includes transportation, guide services, guide gratuity, bottled water and snacks while in the vehicle, and sales taxes. Day 1 dinner and Day 2 lunch are not included. Reservation deadline is January 25, 2013 Cancellations/refunds: 100% refund if cancellation request is received by Pueblo Grande Museum Auxiliary before January 26, 2013. 50% refund if the request is received January 26, 2013 to February 7, 2013. No refunds will be granted after February 7, 2013. Tour is subject to cancellation if a minimum number of reservations are not met. For general information or questions: Go to www.pueblogrande.org, email pgmaux@gmail.com or call Pueblo Grande Museum Auxiliary at (602) 495-0901. Make reservations Online at www.pueblograndestore.com and click on Tour. For information about the tour and accommodations: Contact Leonardo Gem at Across Arizona Tours (602) 233-1813. Great information to keep in mind because some friends told me about these private tour guides and i want to see them for myself, thanks!